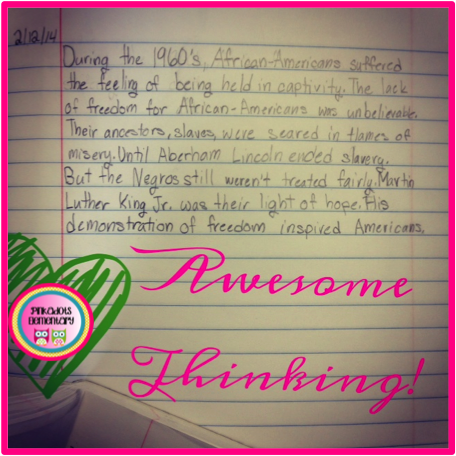 Pinkadots Elementary : Falling in Love w/ Close Reading Part 2! Falling in Love w/ Close Reading Part 2! Well, yesterday we were unable to finish the lesson because the kids were so wrapped up in their amazing conversations over the word choice used in MLK's speech. Their inferences and interpretations were amazing, but still I was nervous for day two. Kara and I were set to co-teach the rest of the lesson today and believe it or not, it actually happened. The goal of today's lesson was to revise the main idea sentence to match the tones and emotions of the speech. We started by reviewing the chart of main idea sentences the students came up with yesterday, along with the chart of emotional words used in the speech. Kara led the class to understand that although we charted everyone's main ideas, they basically all mean the same thing. 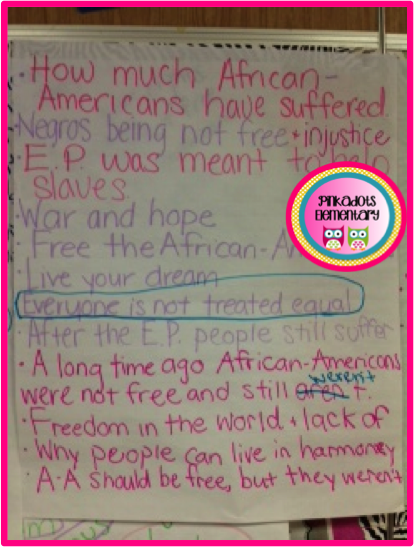 The class chose a main idea sentence to revise: Everyone is not treated equal. We discussed the emotions that this sentence made us feel and the class agreed it was an angry sentence. Looking at our color coded chart we discussed all the words circled in blue (those were color coded for angry). 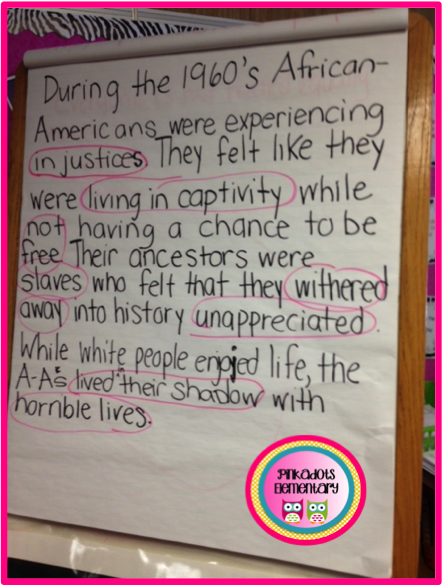 Together we came up with a paragraph using the words to help explain the sentence and turn it into a paragraph. We started pretty basic to give the students a chance to go above and beyond. 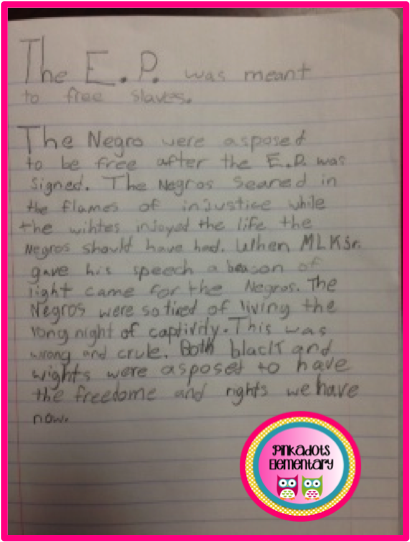 Together we came up with, "During the time of MLK, African-Americans were not treated equally. They experienced injustices that made them feel not equal and angry. African-Americans felt they were living in captivity just like slaves. This is WRONG. Everyone deserves freedom. We read through this paragraph a few times and discussed why it was better than the lonely main idea sentence we came up with yesterday. The students all agreed they felt the emotions, just by reading the paragraph and the words also helped support the main idea. We circled all the words that led us to feeling the emotions and checked they all related to being angry. Next, the students turned to their talking partners, held conversations about how to create their own paragraphs and chose their starting main idea sentence. We made sure they all did a lot of talking before writing. At this point I thought it was going to be difficult for the students, but I was pleasantly surprised. Besides the students being SO obsessed with the content, they were really working hard. Kara and I bounced around the room and met with all the groups. We gave them feedback and shared some examples out loud. Kara even challenged some students to incorporate multiple emotions into their paragraph and we discussed how this could be done (see the examples below). Some students still need to finish, but the students who did finish, did awesome! When Kara went off to her next meeting, I repeated the lesson with my second class, the same way. They ended up choosing the same main idea sentence to revise, but together our paragraph came out different, but still wonderful. During the 1960s African-Americans were experiencing injustice. They felt like they were living in captivity while not having a chance to be free. Their ancestors were slaves who felt that they withered away into history unappreciated. While white people enjoyed life, they African-Americans lived in their shadow with horrible lives. This class also did amazing with their responses and like the first class, were full of pride! The E.P. = The Emancipation Proclamation. This was my favorite response! I was seriously impressed! So I would absolutely say these past few days were an amazing success in the classroom. I was pushed (in a good way) to jump out of my comfort zone and try something new while having the support from my coach. This was only one chapter of the book, so I am excited to work through the rest of it. Am I Falling in Love with Close Reading? Well, if my class has fun, is highly engaged, and is learning... then I would have to say, YES! Excellent and realistic title for a great book! I think that's exactly how the coaching program is supposed to work. We work well together as a team and I am already thinking of next week's lesson to impress her with! If you haven't already entered, don't forget to enter for a chance to win your own copy of Falling in Love with Close Reading by filling out the form below! If you missed part one of this lesson, check out the post about the awesome book, Falling in Love with Close Reading! HERE! If you'd like to take a look at what we worked with this week, check out my Google Doc, HERE! 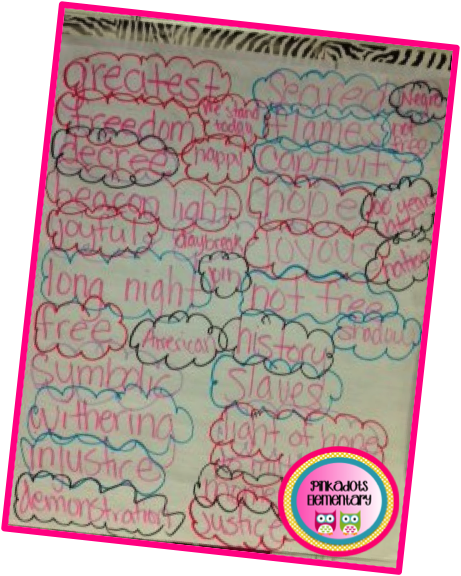 Kara also blogged about a few more lessons using the Falling in Love with Close Reading book as a mentor text, HERE! My principal just started using CLOSE READING as our topics for Banking Minutes. My school goes to school a few minutes longer each day so that we can bank our minutes and have an hour on Friday for PD. We have created text dependent questions and read aloud articles in jigsaws to get us prepared for the shift! Thank you for the timely blogs!! Next year, I will be teaching SS/Science. My kiddos will benefit from the instruction I deliver using the strategies found in this awesome book. It would also be great PD for me!! I love how you stretched out your main idea sentences. Thank you for the chance to win this book! Thanks so much for the detailed posts on close reading - I really appreciate it. Would love to win, adding it to my reading list for sure!